Want to see a video of this awesome belt spinning? If so, just click view full details and then click the thumb nail icons/pictures to load the video. Welcome to the hottest new custom championship belt by ProAmBelts, called Spinner. Our emotions are spinning out of control because of this gorgeous new invention where even the MAN wants a piece of this pie. What a great belt with a synthetic strap, that looks and feels like a pure leather. Our straps don't break or crack, and we spent years figuring out a great combo of materials to make an amazing strap that is flexbile and sturdy and measures about 54" in length with adjustable snaps on the ends. The 05 plates can be customized on this belt with your graphics, logos, wording, and photographs. The big circle in the middle is the spinning section, which spins in both directions. 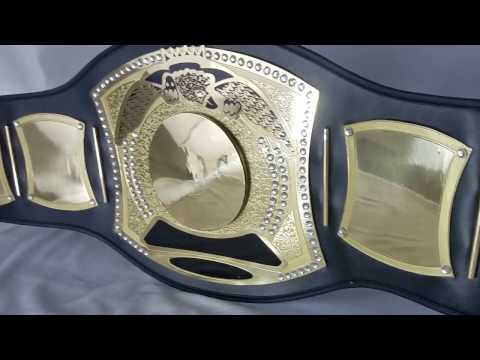 Contact us for a free layout on this belt. This is a big belt, so be preapred as you might need to us 02 hands to hold it up. Our belts are made out of brass, and the centerplate is about 10" tall, and 11" wide, while the side plates are about 4.5" x4.5". Remember to send us back some videos or images of you getting your spin on!